Why is the Guardian afraid to expose their readers to the truth about Global March to Jerusalem? While happily watching Sarah Colborne and her few supporters getting absolutely destroyed below the line for the lies in her CiF article Jerusalem is at the heart of the Palestinian struggle, March 27, I noticed that there was one type of comment which absolutely terrified the Guardian. This comment has been “disappeared” in true Guardian style. Now it so happens that the first two examples I saw are still up on the website but did not provide clickable links, so the lazy moderators presumably missed them. I leave it to the reader to search for them. But the question remains – why is the Guardian so scared of its readers following a link to a website that exposes the truth about the organizers of the stunt, in completely factual and researched terms? Surely it cannot be because it still believes it can maintain a walled garden, where its readers will only read the lies people like Sarah Colborne put out? As SantaMoniker asked , If the Guardian thinks it has a case why will it not allow opposing views? Was there any disreputable language? Was there anything in the “disappeared” comment that really infringed on their sacred “community standards”? What is the Guardian afraid of, other than the truth? When a paper tries to keep its readers in the dark, as if in a poorly lit restaurant, one can only wonder why they do not want visitors to the site to see what is really being dished up for their consumption. Regarding Colborne, there are a few more interesting background facts that make one wonder, once again, at the Guardians foolishness and agenda in trying to cover the tracks of its contributors. Colborne was, as Adam Levick pointed out , one of those on the Mavi Marmara, ably assisting the terrorist group IHH in its attempt to breach the naval blockade of Gaza and later trying to provide PR spin about the events. Strangely, this clip, which I can now no longer get to play at the time of writing, was not added at the bottom of her column, which is so often the usual practice of the Guardian. Hunting for it, I came across a remarkable article – remarkable also for being published in the Guardian – by Carmel Gould that may explain this unusual omission. 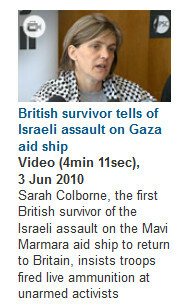 Gould’s article, The end of the media’s Israel fixation?, references the BBC interview during which Colborne was not allowed simply to spout her version of the attack on Israeli Seals but was caught in her lies about the Mavi Marmara incident out under persistent questioning by Sarah Montague. This article is the subject of a legal complaint made on behalf of Sarah Colborne. A stalwart of the Palestinian PR machine, Sarah Colborne of the Palestine Solidarity Campaign, who was on board the boat, was generally given free rein across the media to accuse Israel of inexplicable mendacity. However, it was only when subjected to a rare grilling on the BBC’s Today programme that she came unstuck. Sarah Montague’s questioning about who started the violence and the presence on board of wannabe martyrs, left her implausible tale of innocence seriously compromised. The Montague interview (the “rare grilling”) starts with Ron Prosser, then the Israeli ambassador to the UK, followed shortly by Colborne. Sarah Montague nails her to the spot and incredulously listens to and exposes the lies in her version of what happened as Colborne blathers on ineffectually with her almost tearful attempts to put across her carefully designed talking points and tries to avoid direct answers to Montague’s questions. An unusually good bit of journalism from the BBC. It is yet another example of the total abandonment of any standards of ethics by the Guardian that it allows a proven supporter of terrorism like Colborne to publish her lies on its website, even if the hundreds of comments BTL largely took her and her supporters to the cleaners – a much needed trip that removed at least some of the dirt. Like SantaMoniker, my post also disappeared. I had written that Colborne was a member of the PSC and that the PSC supports Hamas whose charter calls for the death of all Jews worldwide, not just in Israel. I also pointed out that the PSC’s logo showed the whole of Israel, plus the WEst Bank and Gaza and that they called for a one state solution, into which Jews have already been called unwelcome by Abu Abbas from Fatah. Within an very short time, I had garnered 25 recommends – but when I went back today, some 12 hours later, the post had been removed, as had that moron Berchman’s rebuttal of my post. As SantaMoniker says, the Guardian does not have the confidence of its convictions so must remove anything that questions the word of those it supports and publishes. I stopped reading the Colborne article after the reference to “ethnic cleansing” in the third sentence. And after listening to her laughable performance on BBC Radio I don’t think I’ll bother with the rest. I’m not sure she was so much “almost tearful” as simply snotty-nosed, however. Hmmmm! Rather uncommonly strong words from you. The Guardian ‘has’ dogma and and transgressions of dogma are grounds for moderation. (Gasp). Someone posted a link explaining that Silwan was actually ‘colonised’ by Yamanite’ Jews in the eighteen hundreds. Later when I went back to get the link again to send to someone, the comment was gone. The comment was not antagonistic although there was something about ‘difficult facts’ there but it seems that posting links to historical data that does not fit the Guardian World View are deleted. Cityca – Within an very short time, I had garnered 25 recommends – but when I went back today, some 12 hours later, the post had been removed, as had that moron Berchman’s rebuttal of my post. Berchmans doesn’t ‘rebutt’. He just clowns and parrots phrases that he has heard before. To ‘rebutt’ is something else all together. I agree about Berchmans, which is why I never engage with him. His idiotic posts, with their hard to decipher who said what, plus his Guardian world view make him a must to avoid. This is a march by Islamo fascists and their radical left allies who’se goal is to enslave the Jews in Israel so they live under the fascist rule of the murderous Arabs. They cant accept the fact Israel will never submit to the racist Arabs. These are the savages Israel is dealing with. 30 Israeli civilians were massacred in this Passover attack 10 years ago, including 20 who were over the age of 70. When will the world realize these are the sadists Israel is dealing with. Well done Sarah Montague. Good article, AKUS. I too saw the historical background to Silwan and the Yemanites wiped – the Guardian has learned well from the tactics of the Soviet Union – remember those photos from which those who had fallen from favour were wiped? The other type of post that disappeared were those making reference to the PSc’s well-documented anti semitism. These posts gathered recommendations at a rate of knots, only to be culled by the Guardian moderators. Under normal circumstances all these articles, comments, pictures, youtubes and so on would qualify as ongoing war propaganda against Israel, but strangely enough it is considered as peace propaganda. War is peace, and peace is war. Orwell gave us a model of what lies beyond the horizon of the so called human rights and peace activists. One more example of these institutionalized professionals. I am still taken aback about the term Holocaust militarism. Indeed. To even come up the phrase says a lot about the person who coined it. Don’t be Fritz, makes perfect sense in the twisted logic of the new wave of today’s ‘progressive’ European anti-Semites. Holocaust bad, militarism bad, one negates the other. Bingo, no need for any more faux sympathy for those incorrigible warmongering yids. Thanks, but it is hard to take it without getting .. I don´t know how to express my feelings. The Guardian, if it were a person, would be the living embodiment of the authoritarian personality. Has anyone asked Sarah Colborne why her ‘movement’ is full of Jew-haters and Holocaust deniers? Remember the book of Zechariah? The left and the Islamo fascists want the ethnic cleansing of Jews from Jerusalem. Thats why Holocaust denier is Abbas is trying to deny all Jewish history in Jerusalem. Muslim tolerance allowed the Jews to stand in front of it and weep,’ says Information Ministry official. 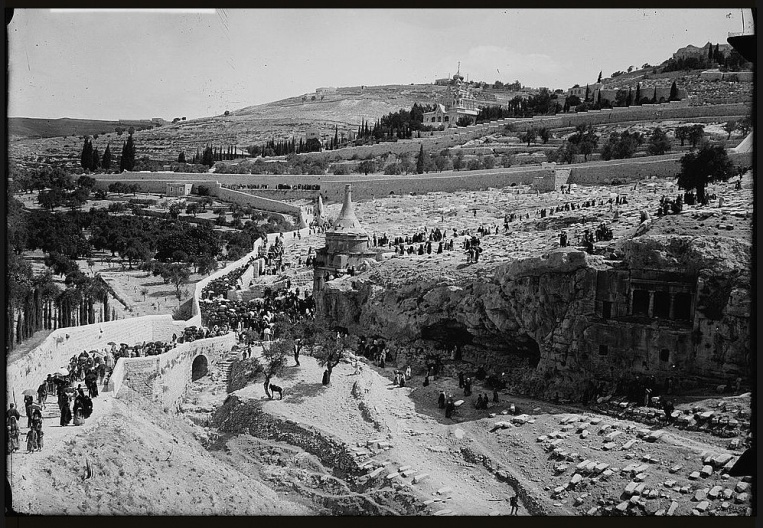 Taha was referring to an Arab uprising throughout Palestine over access to the Western Wall during which 133 Jews and 116 Arabs were killed over a few weeks. The author, who is affiliated with PA President Mahmoud Abbas’s Fatah faction, emphasizes that over the past few decades, Jews have failed to prove that the wall has any connection to their religion.